The Trent Central Student Association (TCSA) in partnership with Trent University is planning a new Student Centre at the iconic Symons Campus in Peterborough, Ontario. The new building will significantly enhance the experience of life on campus for all students by offering new places and opportunities for students to socialize, learn, study and engage in life on campus. Brian, Margot and Matt are helping to organize and facilitate focus groups, online questionnaires and an information booth to gather the views and priorities of the stakeholder community on attributes and key features of the new facility. The ECS team is also preparing a detailed functional space program for the project. This effort will inform the work of the architectural team engaged to design the new Student Centre. 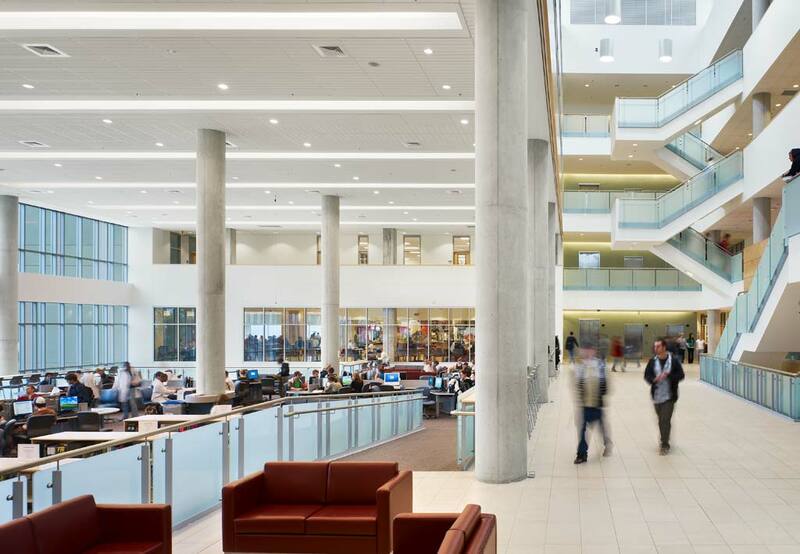 Postsecondary institutions in Alberta have experienced growth over the past decade, and many facilities are under pressure to continue to accommodate increasing enrolments and research activity. Alberta Advanced Education and Technology (AET) commissioned a study to deepen its understanding of space utilization and space management practices in the province and to inform the setting of capital priorities. Michel and Francine looked into inventory management and activity reporting practices at five institutions - University of Calgary, NAIT, Mount Royal University, NorQuest College and Red Deer College - as well as province-wide inventory data compiled by AET and Alberta Infrastructure. Our recommendations outline a method to standardize reporting of space requirements and facilitate the comparison of space supply and demand across the province. Michel presented the report findings and recommendations to a meeting of the Minister, Board Chairs and Institution Presidents in Calgary on March 28, 2011 after which the report was publically released. George Brown College is developing a new health sciences campus in a prime location on Toronto's waterfront. Michel led the development of the functional space program that guided the work of the design team. The new facility is currently under construction and can be seen in a webcam view on the GBC website. The College of Agriculture and Life Sciences (CALS), with more than 3,000 students, 400 faculty and 26 academic departments, is the second largest college at Cornell University and the third largest college of its kind in the U.S. For more than two years, Brian and Waqas worked with Urban Strategic Inc. and Stantec Inc. to develop a Facilities Master Plan to assist CALS better manage its extensive holdings of academic buildings and lands. The project is now completed with the formulation of a comprehensive accommodation plan and priority listing of capital projects matched to funding opportunities. A key recommendation is the development of a new Translational Science building on the Ithaca campus to bring together a broad range of life sciences disciplines in a dynamic, interdisciplinary teaching and research environment.